The 2013 Spring Ride Latest News! The 29th annual Methow Valley BCH Spring Ride is over for this year, but many memories linger of the great weather, food, and ride! 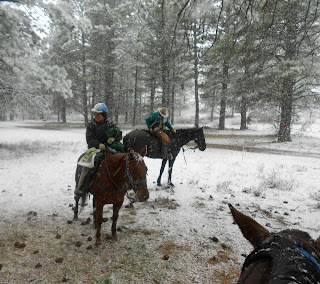 Please click here (or go to the "2013 Spring Ride" tab) to see the photos and read about why this is one of the favorite horse camping experiences in the state. Seven intrepid riders from MVBCH (plus one "son-in-law to be") participated in the trail flagging party for the Spring Ride at Beaver Creek Campground on Sunday April 21st. They had some invigorating weather to enjoy! 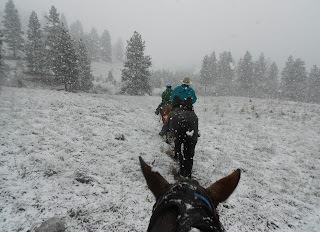 Betty Wagoner, Jackie Iddings, Mary Pat Bauman and Nate (Mary Pat's son-in-law to be), Julie Johnson, Julie Hensley, Sue Robbins, and Suzan Davis started out on the trails with light snow, and ended up in a near blizzard! 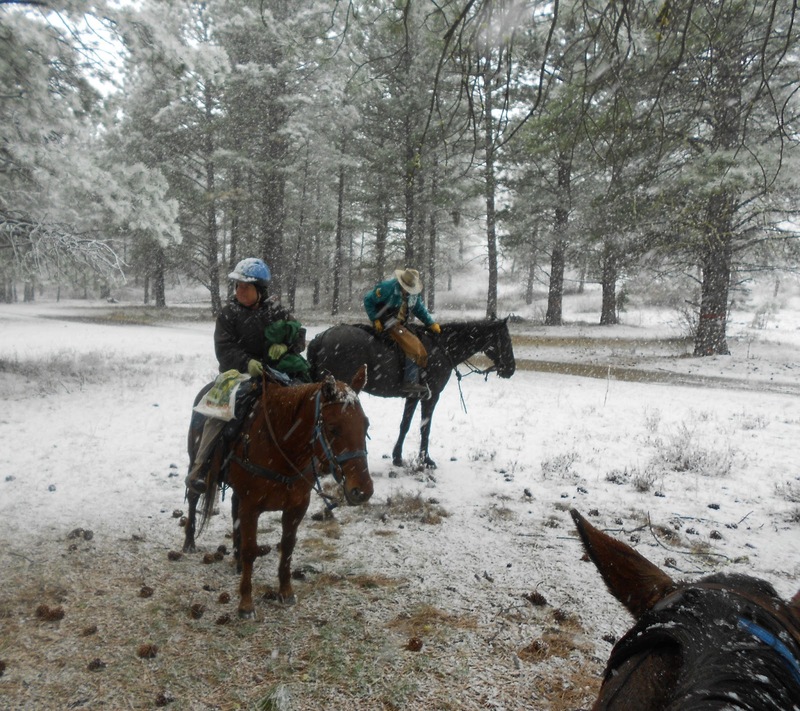 They had a great time in the snowy wonderland and enjoyed the ride, though somewhat surprised by the wintery scenes. Nonetheless, the trails are now marked and will be easy to follow come Spring Ride. Weather is going to soften this week, the snow will melt, and NOAA is predicting a beautiful weekend to come--it may be chilly (dress warm! ), but it will be beautiful. 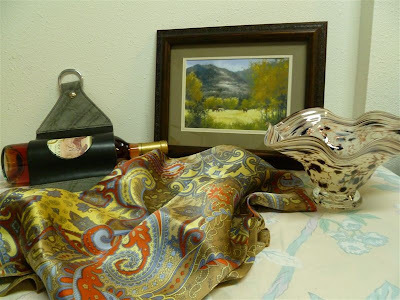 Take A Peek at the Silent Auction Items for our 2013 Spring Ride! Of course, we'll have our Spring Ride T-shirts and jackets available for sale, but you can't see them here--you'll have to wait for the Ride! This year we will have some special "wild rags" for sale too. 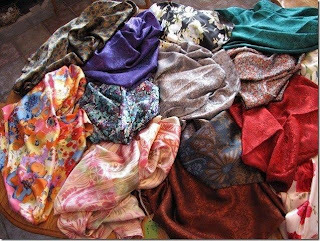 The wild rag has long functioned in the west as much more than merely an adornment. The handkerchief which encircled every cowboy's neck was intended as a mask for occasional use to eliminate the otherwise suffocating dust, and not as an article of dress. Wild rags are made of natural breathable fabrics that help wick away moisture and filter out the wind. Cowboys (and others) preferred silk wild rags because it could filter muddy water from a river or watering hole whereas cotton would allow the mud to seep through. 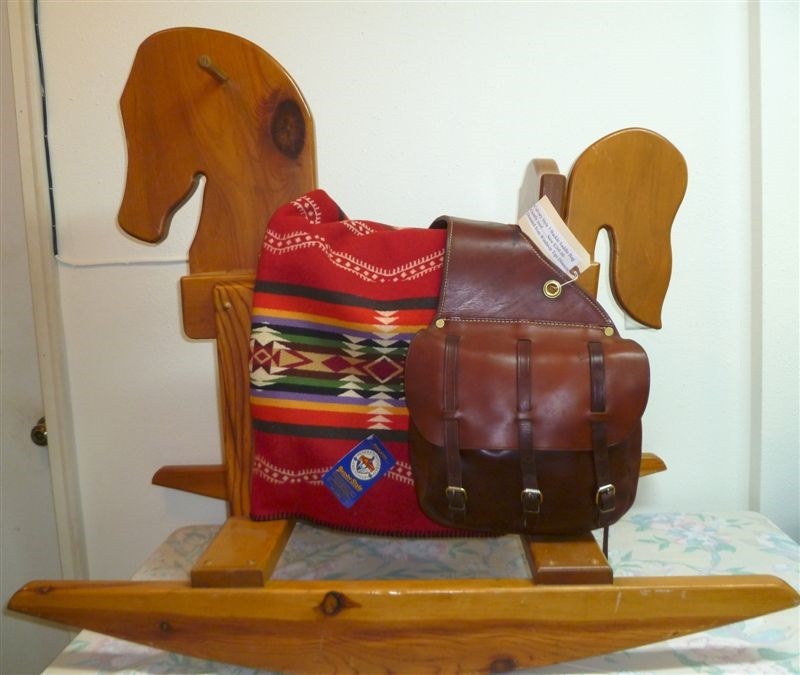 These western wear standards are used in the summer heat to keep cool and in winter cold to keep warm. We'll have a wide selection of them at the Ride for purchase. 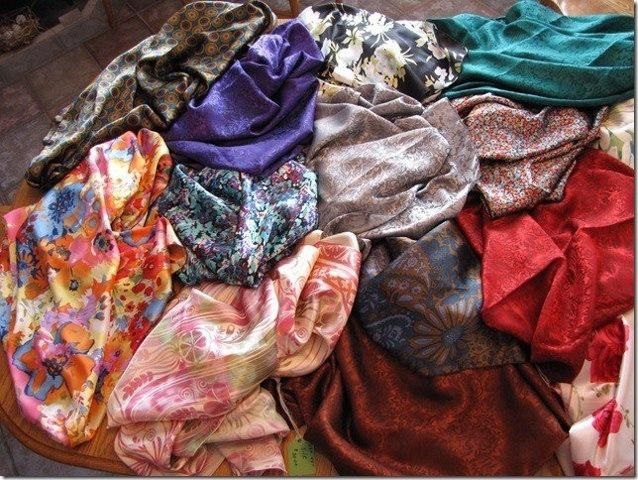 A sample of the Wild Rags that will be on sale. Spring Ride--What you need to know! 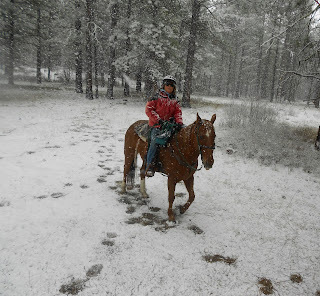 Bring warm gear for you and your horse. A turnout blanket for your horse is a good idea, especially at night when the temperatures can drop considerably. Comfortable horses are generally quieter at night as well. For yourself, be sure to pack warm clothing for day and evening wear. Wool socks are great, as is long underwear. A cowboy had with hurricane strings is always a good idea--it can get windy on those ridges! Gloves should at least be in your saddle bags. Keep your campsite clean. That means no hay, manure, or human garbage when you leave. If you have a collapsible manure barrow, bring it. Some standard wheelbarrows will be provided, but there are far more horses than there are wheelbarrows! There is a designated site for dumping manure--just as for the location when you register. Bring plenty of blankets or an extra sleeping bag. It gets cold once the sun goes down and for many folks, this is their first camping trip of the year. Inevitably, the maiden voyage is the one you find out the heater doesn't work at all, or marginally at best. Horses can water at the creek, but there is no potable (for human drinking) water available so be sure to bring plenty from home. Be sure to pack plenty of grain and hay. There is no grass or natural feed in the camp area. If you just can't leave your dogs at home, they must be left on a leash (or left in your campsite or vehicle). Dogs running free are a real problem for other dogs as well as green horses and riders. There are concrete toilets and portapotties in the Beaver Creek Campground for those whose rigs are not self-contained. Check your propane before you leave home! The Beaver Creek Campground is about 8-10 miles from Twisp, so it's a fairly short drive into town. Twisp also has a pharmacy, grocery store, two feed stores, Les Schwab tire store, two gas stations, a vet clinic, ambulance service, and small medical clinic. We will have a farrier on the ride in case your horse throws a shoe, but availability on an emergency basis might not be right at hand. Bottom line: check your horses' feet before you leave home. Shoes are definitely recommended as rocky ground is the norm in the Methow Valley. The January/February issue of Trailhead News ("Burke Lake Work Party") gave an introduction to this "beautiful, almost mystic area" and the work that has been done by the Wenas Valley Chapter to make this a perfect horse camping destination. In early April, a group of riders from our MVBCH chapter made an excursion to the area for a beautiful camping/riding experience. They came back to the Methow Valley with rave reviews! Sarah Hawes at 509-787-1320 (Tues/Wed/Thurs 1:00 — 6:00 PM). The Port of Quincy manages the Bishop Recreational Area on the property. Additional details about the area can be found by clicking here. How Much Do You Know About the Spring Ride? 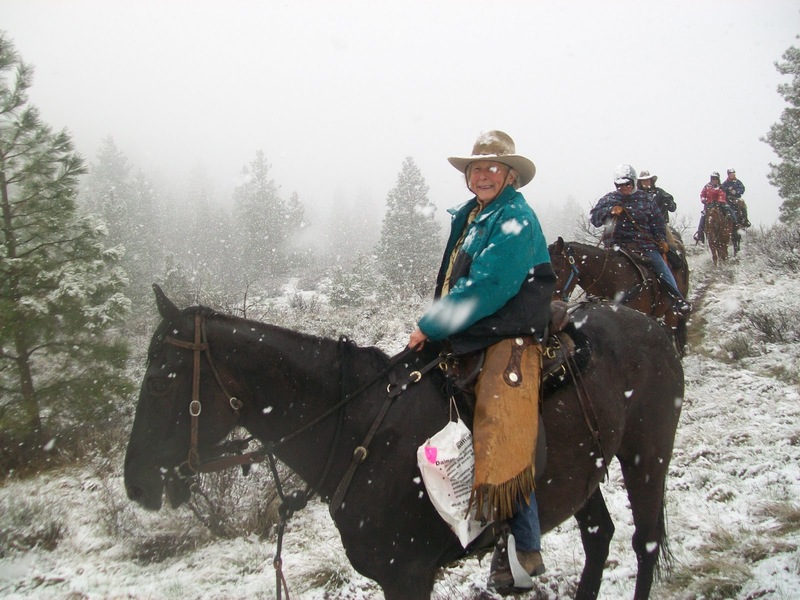 Our own MVBCH chapter member Betty Wagoner spearheaded the very first Spring Ride out of Pateros in 1984. That was even before MVBCH was a chapter! It was a day ride and about 100 riders attended. 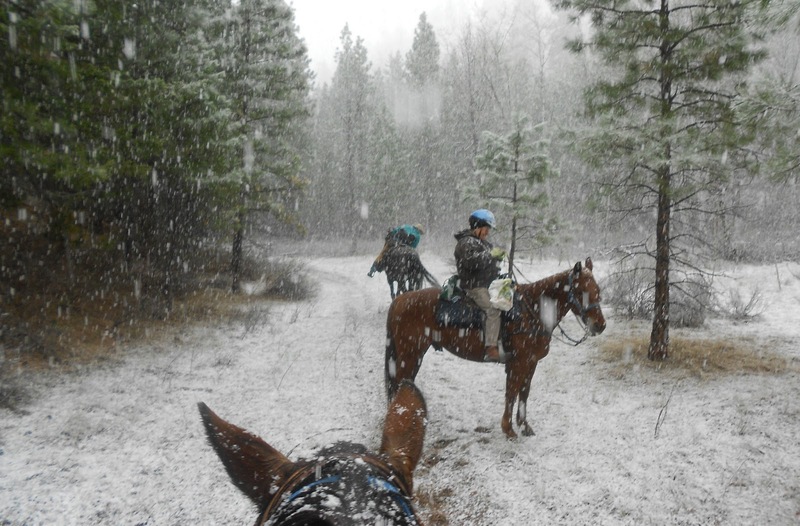 The proceeds of this ride were donated to the Back Country Horsemen of Washington State. The following year the trail went out of French Creek in the Lewis River region of the South Cascades. It was the first overnight event with camping. In 1986, 1987, and 1988 (the 3rd, 4th, and 5th annual Spring Rides) the events were held in Elbow Coulee with about 90-95 horse and riders for each year. 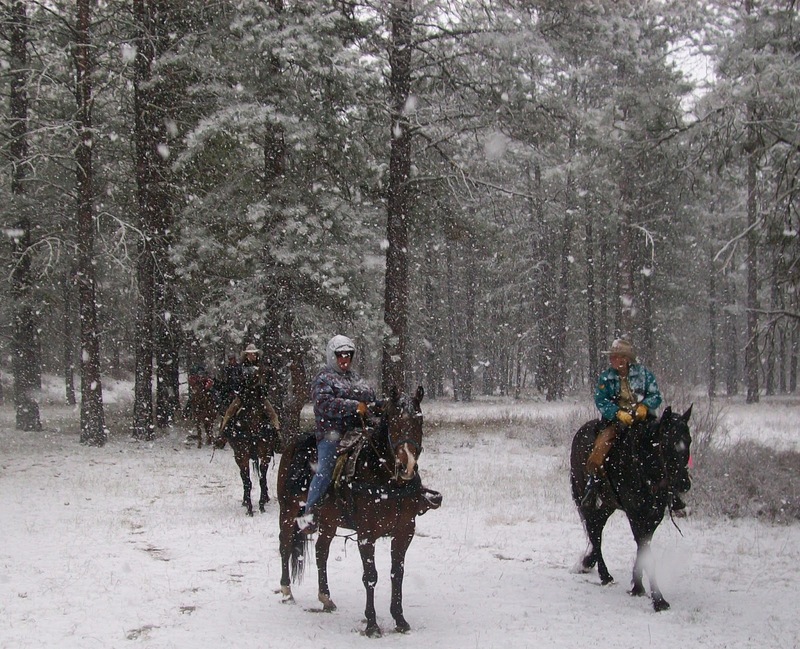 After 1988 the Spring Ride was moved to the Beaver Creek Campground to accommodate more people and horses. We continue to use this beautiful and natural setting to this day. 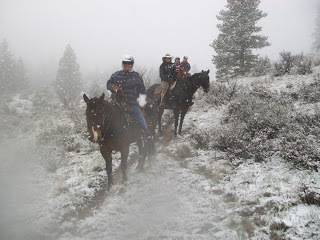 The MVBCH annual Spring Ride horse camping and riding experience has become a favorite of many horsemen, and we have many riders who have attended every one of them!